The standard robot (overlord) is usually equipped with rigid actuators, also known as grippers; they may have a soft coating to limit scratching the surface of whatever object the robot is interacting with, but ultimately the actuators have to be relatively stiff in order to bear the weight of lifted objects. For applications that involve lighter, delicate objects, the stiff actuator would have to be swapped out with a softer, more flexible actuator. Now a team of researchers from the Singapore University of Technology and Design (SUTD) and Shanghai Jiao Tong University (SJTU) has 3D printed multi-material actuators with tunable stiffness that could eliminate having to swap out actuators for different tasks. 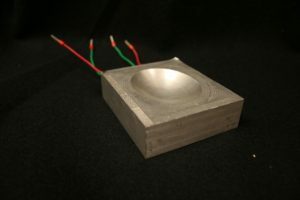 Their actuator includes a layer of a thermally activated shape memory polymer (SMP), which is a material that changes stiffness depending on its temperature. Previous attempts to make actuators with SMPs have resulted in slow responses and limited definition. But the multinational research team used direct-ink writing and multi-material 3D printing to embed heating and cooling elements into the actuators, creating the first fast-response, stiffness-tunable (FRST) soft actuators. -Assistant professor Qi (Kevin) Ge from SUTD’s Science and Math Cluster, co-leader of the project. The heating element is a deformable conductive circuit printed with a silver nanoparticle ink, and a coolant pushed through a fluidic channel provides the cooling. Pressurized air also flows through the actuator to deform it into the open and closed positions when in the rubbery/warm state; the air pressure can be removed once the actuator is stiff/cool and the actuator will hold that shape. The SMP layer makes the actuator 120 times stiffer than the base material without sacrificing flexibility, and thanks to the temperature-control elements, the actuator can go through an entire heat and cool cycle (from 25°C to 70°C and back to 25°C) in 32 seconds. .Yuan-Fang Zhang, a postdoc researcher at SUTD and co-first author of the paper. Of course, no study is complete without actual tests, so the team built a robotic hand with three FRST actuators and demonstrated it lifting and grasping various objects, including a light bulb and a dumbbell. Additive Manufacturing FRST actuators take us a step closer to replicating the amazing dexterity of the human hand, which has a dynamic stiffness thanks to a symphony of cooperation between bones, muscles, tendons, blood, fat, and skin. The hand is a complex thing to duplicate, but with the help of Additive Manufacturing, researchers are steadily getting there. It’s difficult to conceive of all of the uses of these actuators: nearly anything that opens and closes, goes up and down, or changes position; safety releases, valves, and adjustable air registers; and various servos that control the positions of gates. 3D printing a hinge that can open and close itself without a motor or servo is the reality we live in.